Tabor Industrial Park consists of approximately 36 acres of land located northwest of Tabor City just outside the city limits along Hwy 904 West. 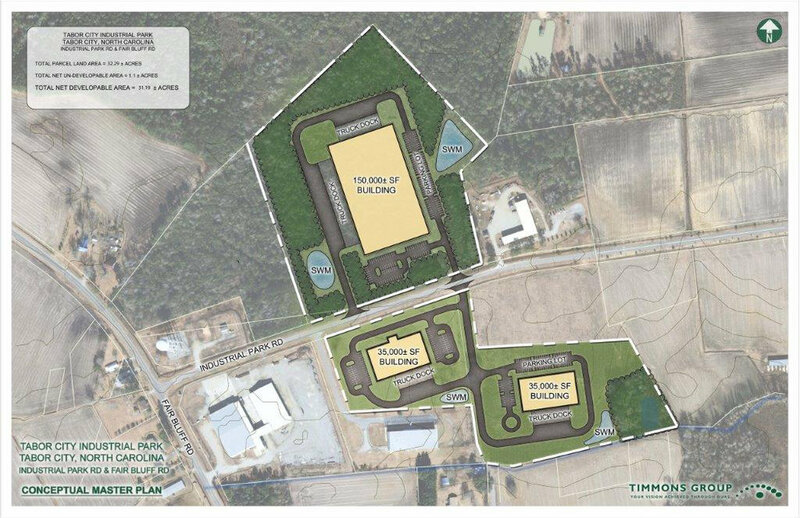 Located just minutes northwest of Tabor City, North Carolina, the Tabor Industrial Park is a 36-acre certified industrial site perfect for small to medium sized users seeking 5 to 10 acres of land priced at $10,000 per acre. The park has all new infrastructures including water, sewer, natural gas and electricity. Rail service is available in Tabor City with the RJ Corman Railroad able to link companies to a CSX mainline in Mullins, S.C., just 30 miles away. Tabor City sits amid fertile soils and a vibrant and diverse agribusiness region with abundant crops of sweet potatoes, corn, soybeans and watermelon. Columbus County fields can supply food and beverage industries operating at the national and international levels. Businesses here enjoy access to diligent, well-trained workers. North Carolina has the nation’s second-lowest unionization rate. And with the campus of Southeastern Community College 16 miles away, arriving and expanding industries have convenient access to free workforce training customized around their unique needs.